Call us today at 949-494-9721! We also offer Same-Day Appointments and Emergency Vet Services! One of our Laguna veterinarians is waiting to serve you from our qualified staff, which includes Dr. James A Levin D.V.M., Dr. Heather Schoeppe D.V.M.,Dr. Amy Rosencrantz D.V.M., and Dr. Cathy Nguyen. New customers are encouraged to visit our Web Promotions page to find coupons good for a Free physical exam for a dog or cat to make sure everybody is healthy and happy. 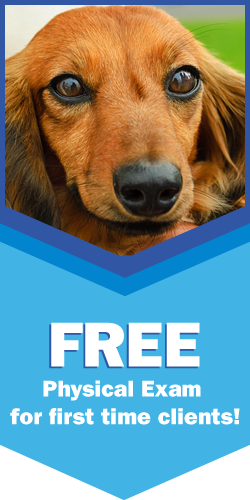 This will give you and your pet a chance to meet with a professional, courteous Laguna vet and get to know us so we can learn a bit about your needs as well. Laguna Beach Animal Hospital works to make Laguna veterinarian services highly accessible and easy to use. You can either Request an Appointment online or give us a call at (949) 494-9721 for a same day appointment. No need to put off shots or a much needed checkup when you can call us and get your pet in the same day! Our veterinary hospital is conveniently located at 460 Forest Avenue in Laguna Beach. Call or come and visit to learn how a kind and caring veterinarian from our friendly staff can help you today. Remember, at Laguna Beach Animal Hospital, your pets are our family! Sign-up using the form or call us at 949-494-9721 to take advantage of this exclusive offer.